US housing data, Inflation data in the UK, the US and Canada, FOMC Meeting Minutes, Philly Fed Manufacturing Index, Janet Yellen’s speech are a few of the major events on Forex calendar. 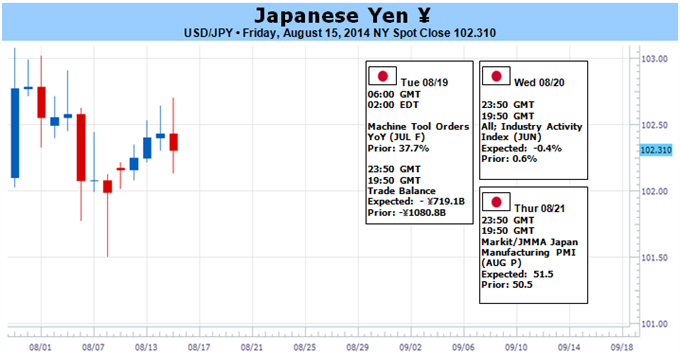 Follow along as we explore the Forex market movers for this week. Last week US retail sales disappointed with a flat reading in July, a poor start to the third quarter, suggesting some loss of momentum. Economists expected 0.2% increase. The unchanged reading was the weakest since January, preceded by a 0.2% gain in June. However, despite the lukewarm release, sales are expected to rise in the coming months thanks to the growth trend in the labor market, strengthening domestic demand. The uneven economic growth will enable Fed Chair Janet Yellen to keep interest rates low for a longer period. UK Inflation data: Tuesday, 8:30. UK consumer prices edged up 1.9% in June, reaching a five year high amid price rises in food and summer clothes. The reading was higher than the 1.6% climb forecasted by analysts and topped May’s 1.5% increase. This rise may prompt the BOE to increase rates sooner than estimated. Inflation is expected to remain tame in the coming months, however, inflation threat will rise if wages increase. UK consumer prices are expected to reach 1.8% this time. US Building Permits: Tuesday, 12:20. U.S. housing starts and building permits unexpectedly fell in June, indicating uneven growth in the housing market, following the slowdown in late 2013. Permits declined 4.2% to a 963,000-unit pace in June, while economists expected them to rise to a 1.04-million unit pace. Permits for single-family homes edged up 2.6% to a 631,000 unit-pace, the highest level since November. Permits for multi-family housing plunged 14.9% to a 332,000-unit pace. A rise to on million unit pace is forecasted now. US Inflation data: Tuesday, 12:30. U.S. consumer prices gained 0.3% in June, following 0.4% increase in May, amid a rise in gasoline prices. The rise was in line with market forecast. On a yearly base CPI edged up 2.1% as in May, indicating inflationary pressures are building up. Fed Chair Janet warned the Fed may raise interest rates sooner than estimated if the job market continued to improve. Meanwhile, core inflation excluding energy prices rose 0.1% after rising 0.3% in May. In the 12 months through June, the core CPI increased 1.9 % after climbing 2.0% in May. Consumer prices are expected to rise 0.1% , while core prices are expected to gain 0.2%. US FOMC Meeting Minutes: Wednesday, 18:00. The FOMC minutes from June meeting showed that taper continued as scheduled, expecting to end in October, if all goes well. The Fed is forecasted to stop reinvestment of paid principal on bonds as soon as the first rate hike is announced. For controlling the pace of unwinding, interest on excess reserves (IOER) will be the key tool and reverse repos will play a supporting role. The Fed noted a rise in inflation, however the lob market recovery is not complete despite recent improvements. US Unemployment Claims: Thursday, 12:30. The number of Americans applying for U.S. unemployment benefits increased last week to 311,000 from 290,000 in the previous week. Despite the 21,000 climb, jobless claims remain close to pre-recession levels. The four-week average, a less volatile measure, increased 2,000 to 295,750, nearing the averages before the Great Recession in late 2007. The number of jobless claims is expected to grow by 299,000. US Existing Home Sales: Thursday, 14:00. The U.S. existing home sales edged up in June to a seasonally adjusted annualized rate of 5.04 million units, rising 2.6% from May, however still below the 5.16 million-unit rate seen last year. Economists expected a lower figure of 4.98 million units. Inventories remained high and price gains slowed in many parts of the country increasing transactions. Nevertheless, the housing sector remains a concern for the Federal Reserve ever since the rise in mortgage rates in 2013. Existing home sales are expected to reach 5.01 million units. US Philly Fed Manufacturing Index: Thursday, 14:00. Manufacturing activity in the Philadelphia-region picked up in July to 23.9 points, rising 6.1 points from June. This was the fastest gain in more than three years. Analysts expected the index to drop to15.6 in July. The current new orders component increased 17 points. The current indicators for labor market conditions to improve. Philly Fed Manufacturing Index is expected to reach 20.3. Janet Yellen speaks: Friday, 14:00. Federal Reserve Chair Janet Yellen will speak to the central bank’s symposium in Jackson Hole, Wyoming. Yellen will deliver a speech titled “Labor Markets.” She will not answer questions from the audience. The Fed’s three-day gathering of central bankers and economists will be titled “Re-evaluating Labor Market Dynamics.” The conference has foreshadowed some of the Fed’s major policy shifts. Market volatility is expected. Mario Draghi speaks: Friday, 18:30. European Central Bank head Mario Draghi will follow Federal Reserve Chair Janet Yellen’s speech at the Jackson Hole Symposium and talk about employment issues. Market volatility is expected. The two headline themes for dollar watchers – the Fed’s place in the rate forecast and appetite for safe havens – offered the greenback little fundamental bid this past week. And yet, the dollar held up well. This stability through unfavorable circumstances is unlikely to hold out forever however. In the past month-and-a-half, the currency has reversed from a significant escalation of a bearish trend bearing and subsequently marked impressive gains. Yet, without fundamentals to support the move, the speculative drive can easily collapse on itself. If we were to refer to the indicators used to track the major fundamental themes, it would seem that the dollar’s greatest fundamental concern would be the diminished sense of fear in the financial system. The S&P 500-based VIX Volatility Index dropped sharply from the rapid climb over the previous weeks. This deflated ‘risk’ was not unique to equities, but the retreat was far more moderate for asset classes like FX and rates. What is interesting though is that the greenback has not suffered substantially from the rebalance. This is likely because the currency’s advance was not particularly dependent on the swell in the first place. The reserve currency is considered a liquidity haven – a more extreme measure of safe haven. Furthermore, though much of the edge was dulled in the volatility indicators, the underlying trends are still rising. From positioning in the capital markets, we also see a reticence to return to the same level of exposure and leverage that have become the hallmarks of complacency and contentedness. US equity indexes (S&P 500 and Dow) are slow to return to record highs, while European benchmarks haven’t even put up a convincing recovery. 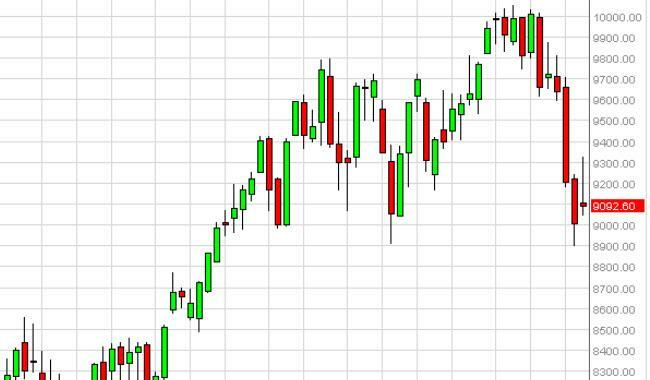 Elsewhere, one of the more popular short-term speculative trades – selling jumps in volatility via ETFs, futures and options – has substantially abated. This isn’t evidence that a wholesale unwinding of risk is imminent, but it does show a crack in speculative build up. While risk trends can override all other themes when active, the dollar is more likely to find an active driver in interest rate expectations. This past week, data pertaining to policy speculation was light. However, there were a few Fed opinions that show how contentious the debate over stimulus and interest rates is amongst the FOMC. Known-dove Kocherlakota remarked that the economy is still far from its policy objectives and a hike in the near future was unwarranted. A direct contrast, regular hawk Bullard said they were closing in fast to their employment and inflation objectives, which has shaped his expectations for a hike in the first half of next year. According to economists polled by Reuters and Bloomberg, the timing for the first rate hike still projects a mid-2015 move. That is similar to the Fed’s own time frame. And yet, the market continues to discount those forecasts. Is the market truly skeptical for the timing of the first move and subsequent pace, or is it simply a reflection of speculative positioning holding out? As evidence mounts one way or the other, we will reconcile this question. In the week ahead, rate speculation will be fed by two important updates: July CPI and the Jackson Hole Symposium. The consumer price index is not the central bank’s favored inflation reading, but it is the one that the market is more prone to speculate around. Moderation could trip up the dollar, but it is unlikely to ignite a new trend. Alternatively, a pickup in price pressures can close the gap between market and Fed forecasts. The Kansas City Fed’s sponsored event to discuss economic, monetary and financial issues will generate a lot of interest. This meeting often offers up candid forecasts and opinions that we don’t normally see in normal policy channels. Fed Chair Janet Yellen is on the docket, but the global central banker tone can carry serious weight for general investor sentiment as well. Last edited by 1Finance; 08-16-2014 at 08:29 AM. 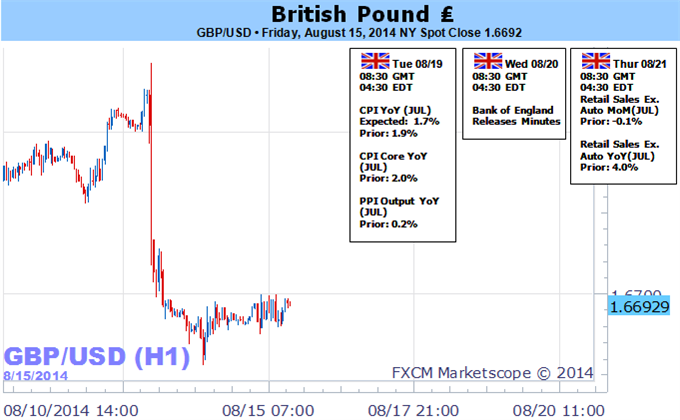 British Pound Heads into Critical Week - Could it Finally Bounce? The British Pound fell for the sixth-consecutive week, matching its longest streak since setting key lows near $1.43 in 2010. Yet there are signs that the move may be overdone, and key data ahead promises big moves for the GBP. Upcoming UK CPI data could drive important volatility in the British currency. Analysts expect that the numbers will show inflation remained below the Bank of England’s official target, and indeed low price pressures have limited expectations of future BoE interest rate hikes. And indeed the bank’s recent Quarterly Inflation Report forced an important GBP sell-off as officials talked down the likelihood of tightening policy through the foreseeable future. Expectations have fallen so much that any higher-than-expected CPI inflation figures could spark an important GBP bounce. The subsequent BoE minutes and Retail Sales figures are less likely to move markets but remain worth watching for potential surprises. We thus head into a potentially pivotal period for the fast-falling British currency, and we have to go back to the heights of the global financial crisis in 2008 to find when the GBPUSD last fell for seven consecutive weeks. This fact in itself hardly guarantees that the Sterling could finally reverse, but we have seen concrete signs it may have set an important low through recent trading. The USD/JPY pared the decline from earlier this month, with the pair trading back above the 102.00 handle ahead of the Fed’s Economic Symposium in Jackson Hole, Wyoming, but the dollar-yen may continue to carve a string of lower-highs in August as it preserves the opening monthly range. Despite the 1.7% contraction in Japan’s 2Q growth rate, the better-than-expected GDP report may keep the Bank of Japan (BoJ) on the sidelines at the September 3 meeting, and it seems as though the central bank will retain its current approach for monetary policy throughout 2014 as Governor Haruhiko Kuroda remains confident in achieving the 2% target for inflation. With that said, the Federal Open Market Committee (FOMC) Minutes and the Economic Symposium highlights the biggest event risks for the week ahead, and the fresh batch of central bank rhetoric are likely to spark increased volatility in the USD/JPY as market participants weigh the outlook for monetary policy. With Fed Chair Janet Yellen scheduled to speak on August 22 at 14:00 GMT, we would need to see a greater willingness to normalize monetary sooner rather than later to favor another run into the 103.00 handle, but the Fed conference may do little to boost the appeal of the greenback should we get more of the same from the central bank head. In light of the recent commentary from Fed Vice-Chair Stanley Fischer, it seems as though the majority of the FOMC remains in no rush to move away from the zero-interest rate policy (ZIRP), and a new wave of dovish commentary may generate a near-term decline in the U.S. dollar as market participants push back bets for a rate hike. As a result, we would need to see the Fed boost interest rate expectations to see a further advance in the USD/JPY, but the pair may ultimately target fresh monthly lows in the week ahead should the central bank sounds more dovish this time around. 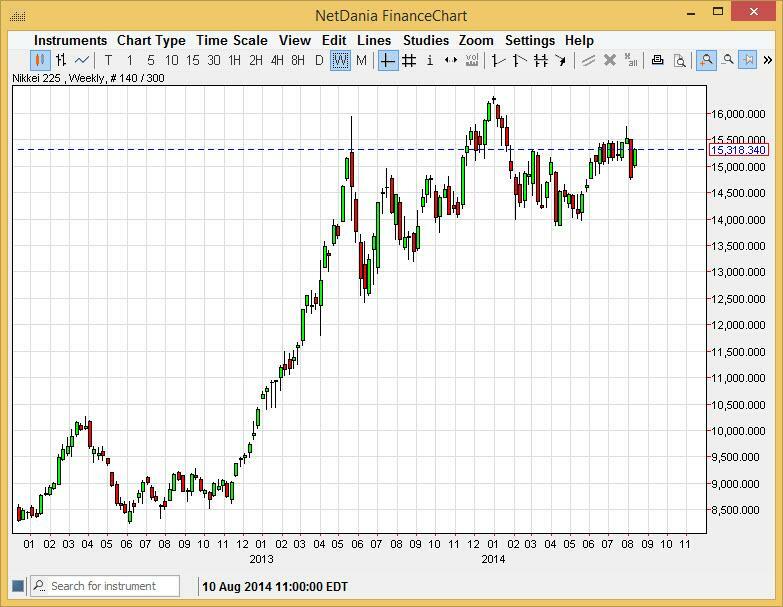 The Australian Dollar managed to reclaim lost ground over the week to finish marginally higher. A lift in local business and consumer confidence figures offered a positive signal for the domestic economy and kick started the Aussie’s recovery. Further gains were afforded by a broad return to high-yielding instruments as traders looked past disappointing Chinese economic data and Ukrainian tensions eased. Over the coming week, the RBA’s August Meeting Minutes and the HSBC China Flash Manufacturing PMI data are the most noteworthy pieces of regional event risk for the Aussie. The Reserve Bank has held steadfast in its preference for a ‘period of stability’ for rates and the Minutes are unlikely to reveal any major revelations. In the absence of a more dovish tone from the central bank the Aussie could remain elevated. Meanwhile, another upside surprise to the Chinese manufacturing data could offer the Aussie a source of support. A string of recent improvements in the leading indicator have helped alleviate fears of a further deceleration in economic growth within the Asian giant. A rebound in Chinese economic data bodes well for the Australian economy via the two country’s close trading ties. Geopolitical tensions will likely remain in the background over the coming week. Although the embers of the latest flare-up are still glowing, the Australian Dollar may continue to demonstrate resilience in the absence of a material escalation of regional conflicts. The scarcity ofsentiment-shifting regional catalysts over the coming week suggests the Australian Dollar’s path of least resistance may be for it to remain range-bound between 92 and 95 US cents. Refer to the US Dollar outlook for insights into how the USD side of the equation may influence the pair. A relatively timid domestic calendar is led by second-quarter PPI figures. New Zealand price-growth data has increasingly underperformed relative to consensus forecasts since February, suggesting economists have tended to overestimate inflation and opening the door for a soft print. Such an outcome would suggest the RBNZ may be relatively slow to resume raising interest rates after signaling a pause, weighing on the exchange rate. External factors may prove to be a more robust catalyst as hefty event risk emerges from the US by way of July’s CPI figures as well as the release of minutes from last month’s FOMC policy meeting. The headline year-on-year inflation rate is expected to tick slightly lower to 2.0 percent, down from 2.1 percent in the prior month. A steady stream of above-consensus readings since the beginning of the year seems to put surprise risk on the upside. As for the Fed, it notably upgraded its language on price growth in July’s FOMC statement, saying the “likelihood of inflation running persistently below 2 percent has diminished”. Indeed, it will be the reasoning behind this seemingly subtle but nonetheless significant change in verbiage that investors will be most concerned with as they comb through the Minutes document. If policymakers are turning more sanguine about inflation, that means the time gap between the end of QE3 – expected in October – and the first subsequent interest rate hike may prove relatively short. An upbeat CPI print would only reinforce such thinking. On balance, such a scenario bodes ill for the New Zealand Dollar. As the highest-yielding currency in the G10 FX space, the Kiwi stands out as particularly vulnerable if risk appetite unravels and capital flees return-oriented assets for safer shores. The prospect of a sooner-than-expected start to Fed tightening may trigger just such a dynamic. The formative role of US monetary policy in supporting risk sentiment is hardly controversial at this point; one need only compare the five-year trajectory of the S&P 500 and the US central bank’s balance sheet to see it. As stimulus helped build out the risk-on rally since the end of the 2008-09 crisis, so too a shift toward a more hawkish posture may undermine it, and in so doing sink the New Zealand Dollar. Gold prices are softer at the close of trade this week with the precious metal off by 0.40% to trade at $1304 ahead of the New York close on Friday. Bullion had held a tight range below key resistance at $1321 for the majority of the week before tumbling to key support at $1292 on Friday. The losses were short lived however with headlines over the escalating situation in Ukraine prompting a reversal that saw prices pare more than half the day’s decline. With geopolitical tensions on the rise, gold could remain supported with key US data next week and the Jackson Hole Economic Symposium likely to drive prices. Weaker than expected US retail sales, empire manufacturing and consumer confidence this week has continued to cap USD advances near-term with the Dow Jones FXCM Dollar Index struggling to close the week above key resistance at 10,564. The August Preliminary University of Michigan Consumer Confidence survey released on Friday fell short of market expectations with a print of 79.2, missing calls for a read of 82.5 and weaker than last month’s print of 81.8. The data marks the lowest read on the survey since November of last year and follows a string of weaker-than-anticipated metrics for the US. Looking ahead to next week traders will be closely eyeing the return of more pertinent US economic data with CPI, housing metrics and the release of the FOMC minutes from the July 30th meeting on tap. Inflation data on Tuesday is expected to show a slight softening in the annualized rate with consensus estimates calling for a down tick to 2% y/y with core inflation widely expected to hold at 1.9% y/y. Minutes from the latest FOMC policy meeting are released on Wednesday and investors will be closely eying the transcript for clues as to the committees outlook on interest rates and the economy. Look for gold to trade heavy if the minutes show a greater willingness amongst policy makers to begin normalizing sooner rather than later with headlines out of Jackson Hole next week also likely to spur added volatility in gold and USD crosses. From a technical standpoint, gold remains within the confines of a well-defined descending channel formation off last month’s high. Friday’s sell-off took gold into key support at $1292 before rebounding sharply mid-day in New York after reports that Ukrainian forces had destroyed an armed Russian convoy that was crossing the border into Ukraine. This level is defined by confluence of the 50% retracement from the advance off the June lows and the 61.8% extension from the decline off the July high. The sheer magnitude of the rebound took gold back into the initial weekly opening range and as such we’ll maintain a neutral bias heading into next week’s event risk while noting that our bearish invalidation level remains unchanged at $1321. A break sub-$1292 is needed to re-assert our bearish outlook with such a scenario eyeing key support at $1260/68. A breach of the highs targets channel resistance dating back to the yearly high with subsequent resistance objectives seen at $1334 and the July high at $1345. The Nikkei rose during the course of the week after initially gapping above the ¥15,000 level on Monday. With that being the case, we feel that this market probably has underlined strength, but it needs to get above the ¥15,600 level in order to be truly broken out to the upside. With that, we are positive on this market, but understand that there should be continued choppiness overall. Because of this, we like the Nikkei and going long this market, but suggest that unless you are willing to put up with volatility, this may not be the market for you. The DAX initially tried to rally during the course of the week, but you can see that the €9300 level has in fact offered a bit of resistance that the market is currently trying to deal with. The failure to get above there has produced a shooting star though, and that is in fact a relatively negative sign. We believe that the €9000 level below is rather supportive though, so we need to clear at least that, if not the €8900 level to begin selling. On a break above the top of the shooting star, that is obviously a very bullish sign. The NASDAQ rose during the course of the week, and quite frankly is knocking on the door of the massive 4500 resistance barrier. If we can get above the 4500 level, we think this market continues to go much higher, and ultimately to the 5000 level. Any pullback at this point time is simply going to suggests that value is to be had, and that we could go much higher. With that, we are very positive in this market, and have absolutely no plans to sell. 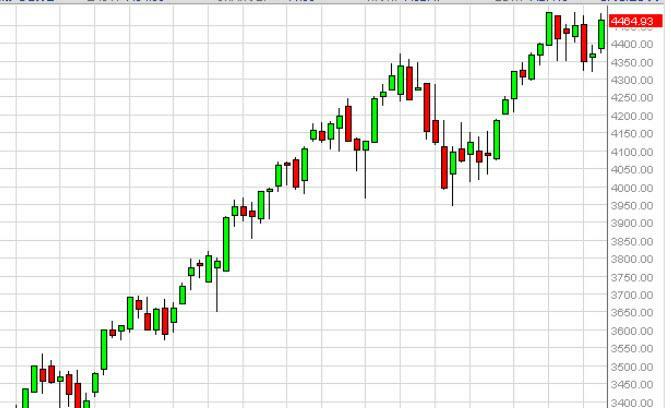 In fact, we believe that the NASDAQ will hit 5000 over the course of the next year.